Cheng-Wen Wu is best known for his pioneering work on the four-step mechanism of gene transcription: DNA binding, RNA chain initiation, elongation and termination. He discovered intrinsic zinc RNA polymerase and transcription factors (later known as zinc fingers), and elucidated their roles in transcription. All these represent important breakthroughs in the field of molecular biology. Due to the rising mortality of lung cancer patients, Professor Wu initiated and led a national research program for lung cancer in Taiwan. His current research focuses on the molecular mechanisms underlying lung cancer initiation, progression, and metastasis. Dr Wu is the Distinguished Chair Professor of the National Yang-Ming University, and Corresponding Research Fellow at the Institute of Biomedical Sciences, Academia Sinica. He graduated from the College of Medicine, National Taiwan University with an MD degree in 1964. He then attended Case Western Reserve University in the US, where he obtained his PhD in biochemistry in 1969. 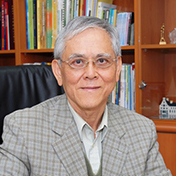 Dr Wu has published over 270 articles in international journals and won several prestigious awards including election to Academia Sinica in 1984 and the 2011 Presidential Science Prize of Taiwan. He is the founder of two most important biomedical research institutions in Taiwan: the Institute of Biomedical Research Institute at Academia Sinica, and the National Health Research Institutes (NHRI), Taiwan.